Our baggages were delayed by two hours! We were planning to get to Mt Rainier in the afternoon and hiking but we couldn't. We flew with American Airline and our baggages were on another airplane. I did some eardrop and heard our plane couldn't take any more baggages. Therefore, American Airline staff moved some checked bags to another flight since the flight will fly to Seattle. Jessica and I were a bit nervous but we trusted the system. "I'm not sure if we will sleep in a tent tonight." I told Jessica. Getting a camp ground was a bit frustrated because all campgrounds at Mt Rainier was full on Sunday that we arrived. Therefore, we had to walk-in and take a chance if we will find a spot. "There are many camping spot empty!!!!" I was REALLY happy that we got a spot for camping. I already book a campground for the second night at Cougar Rock Campground, which was close by Paradise Visitor Center. "Come on Jess! We need to get to the spot before the sunset." I turned back to tell Jess when we were hiking. I did not want to rush Jess from hiking and taking pictures. She was very excited to see new views and mountain and take pictures. Jessica has never been here before. Everything was beautiful. The Sun was coming fast and the temperature drop as fast as the Sun. I could see fog in mountain alley and I was so happy. We hiked back to car before dark. I found out that I forgot to buy cooking gas. Luckily, we bought a lot of snacks from H-Mart before we left the city. "I didn't see anything." Jessica told me when she looked on the sky. I had no surprise. When you try to find milky way with your eyes, you might notice it. I set up our camera and set speed shutter at 15 second. Shutter was released and after 15 second. Jessica saw milky way in her camera. "Let me click the shutter!!!" Jessica was very excited to photography milky way. She had Canon 6D mark I and Sigma 35mm f/1.4 Art Series. We had about 3 hours to shoot milky way tonight. At 1 AM, galactic core moved to the middle of Mt Rainier. "Jess, she is here!" I woke up Jess to see Mount Rainier. She was outshined in the morning because of Sunrise. "Let's go. I'll wake up Dennis. We don't have much time. Wildflowers were not at the peak of blooming yet but still beautiful. My friends and I came to Tipsoo Lake last year but we couldn't find this spot. Dennis took us to this beautiful spot this year. I finally found it! We came back to campground after a long morning for food. Dennis made us Udon because we didn't have gas to cook our food. Our plan for the second day is to get Mazama Ridge with Sunset. Hiking was fun. Mosquitoes were crazy. You cannot say still for too long and mosquitoes here are REALLY BIG. We finished Mount Rainier with Sunrise at Reflection Lake. 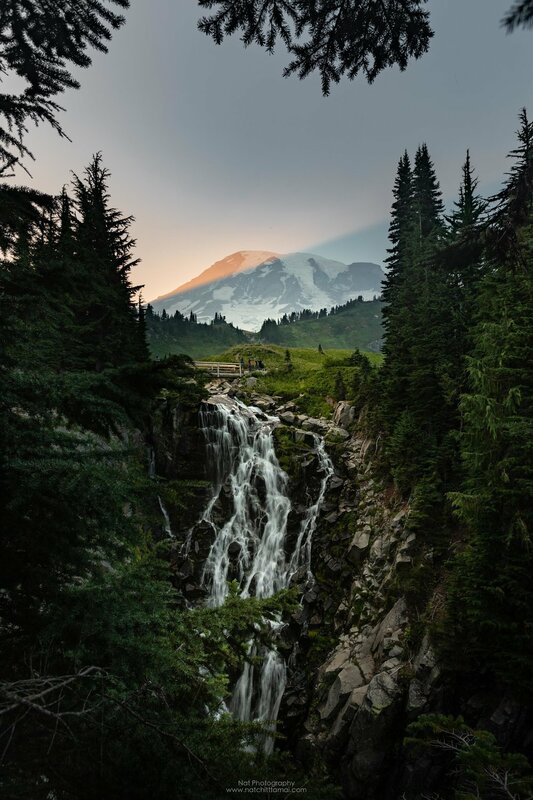 Classic spot that you should visit whenever you come to Mount Rainier. We spend 2 more days in Seattle. JUST TO EAT.